Occult Forum.org • View topic - Your favorite Greek God/Dess? I like Poseidon and Aphrodite, however the God and Goddess I work with on a regular basis are Celtic based. [QUOTE=Centrix;334195]Ah, start on Lucian, then Longus, then Achilles Tatius, then Antonius Diogenes, then Heliodorus, then Apuleius. the Craft now for over two years. But like i've always said, you never stop learning. to be with Her. Hecate's just an awesome Dark Goddess. [QUOTE=Tevnon;335043]I've worked a lot with Athena. Athena called to me before I even knew others in the modern age even still worshipped the old gods. I've worked magic with Athena, performed celebratory rites in her honor, and had her appear in visions. what did you think after you seen Her after life? hey, that's far out. that's a gr8 idea to do. i like being creative also about my Dark Goddess, and try to do things for Her like that when i'm not in a ritual. Circe and Hermes off course. My patrons. Hephaestus, terrible god of the forge and spitting game. Only ugly god and he's still banging Aphrodite. Well, the first change which was obvious is that any remaining doubts I had were blown out of the water. Only once since have I come to question the worship of the old gods, and even then it was a question of if it was healthy, not of if they do or do not exist (and I quickly got over those doubts as well). Anyway, beyond that after my near death experience for the longest time I was totally immersed in magic. My circumstances happened to be such that I could only survive by magic for a time. The same condition that led to the near death experience, still as of yet undiagnosed to this day despite countless doctor visits, was getting in the way of working. I had to learn to survive on magic alone, which I was generally successful at. I also had tremendous success at pretty much any type of magic I attempted, often on the first try, and I would see spirits frequently. I've since worked with many magical systems, but I always eventually come back to some form of Paganism, and in particular Athena; though I generally don't buy all the dogmas and such of Paganism in general. One of the first deities to speak to me was Hecate. For awhile, I also felt connected to Aphrodite as well, but her presence waned with me over time. Hermes Trismegistus, or was he a philosopher only? I am not with any god or goddess, especially one of Greek decent. I only use them when needed, which is rare. She is a goddess of night, and I do most of my business at night. She was one of the first in Greek tradition, and those first and foremost ones are the only ones I ever put forth effort to use. The only one I have had direct experience with is Ares. I feel a kind of ease of attunement when invoking him I've never felt with other entities/gods. The only vulture I've ever seen here in my state was during one of these invocations. Go figure. I also like Cronus: he eats babies. making me Her Dark Child. I've done Hecate rites a lot that gives me more of Her knowledge about Her, and as well as Powers of Her. yes, She is my patroness as well. I have always Invoked her on the New moon. and have done some rites FOR HER as well. She has helped me with life in so much over the years. Hades is cool, I've got to admit that. LOL I've invoked Him in the Ouija Board TWICE for Samhain. LOL It was awesome too! The power in that Ouija Board! WOW! 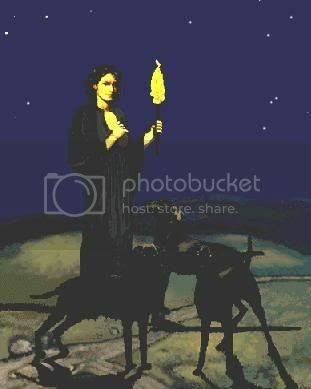 Hecate is not a Greek goddess, nor is she the goddess of the crossroads. At least, that's not who the real Hecate is. That's what the Greeks did to her so that they could squeeze her into their pantheon. The real Hecate was from Anatolia (Turkey), and she was a nature and wildlife goddess who also governed childbirth. So she was quite a bit like Artemis. The Greeks adopted Hecate, but altered her character to suit their pantheon, as Artemis could not be displaced. Her real functions were stripped away and she became the goddess of the crossroads. Her association with magic came even later. Anyway. My favorite Greek god is Artemis. Prometheus is a close second, followed in third by Athena. - meaning "far reaching"/"influence afar"/"omnipotent"
And I do mean Hekate the TITAN. Hekate the ancient chthonic goddess. Hekate worshiped in some cities in the east as divinity-matriarch. Hekate who's dominion was the earth, sky, and underworld all three. Hekate the only Titan that Zeus & Poseidon decided to avoid fighting with when they plotted to overthrow the Titans and establish the Olympian dynasty of gods. ...I do not mean the more modern greek Hekate (scary mysterious underworld lady), or the romanized Hecate (there are no C's in greek) nor 'Trivia' (3-road'), nor the elderly aspect of goddess triads. I mean the early greek (and pre-greek) Ἑκάτη the Titan. And she is also where my name comes from. Kathryn, a modern celt spelling of a name that has changed many times over the last 2700 years. In its original form the name read Ã¢? ?Εκατερινη (Hekaterine) in archaic greek. It means alternatively 'from Hekate', 'of Hekate', or 'like Hekate'. Bacchus is the man but I'm not big on the bitter resin tasting wines (that stuff you sell/import to us is pretty good though) give me some Ouzo but don't give it to me flaming, you are burning precious alcohol off of it! I feel a pull towards Aphrodite and Ares, though I have not worked with either. I plan on invoking them when I am more knowledgeable.